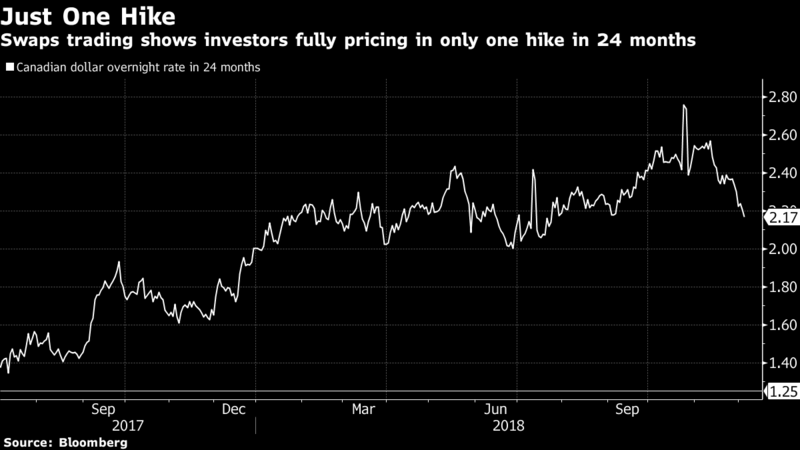 As oil falls and a potential U.S-China trade war threatens the global expansion, investors are fully pricing in just one more increase from the Canadian central bank over the next two years. It would only take a small disappointment -- economic growth falling slightly below 2 per cent, for example -- to eliminate even those chances. If the economy begins to trend lower after that -- possibly because of continued disappointment in business investment outside of energy -- the need for hikes will fade, according to Avery Shenfeld, chief economist at CIBC World Markets. Poloz remains hopeful he won’t be knocked off his hiking path. In its Wednesday statement holding rates rates steady, the Bank of Canada suggested temporary factors were at least partly at play because of last summer’s heightened uncertainty around trade negotiations with the U.S., and spending outside of the energy sector is expected to strengthen now that the two countries came to an agreement along with Mexico. In a speech Thursday, Poloz reiterated his belief the central bank will eventually need to bring the current 1.75 per cent policy rate back into a “neutral range” of somewhere between 2.5 per cent to 3.5 per cent -- citing the backdrop of low unemployment, inflation close to target and an economy that is operating close to capacity. “It’s a very fine line between the kind of growth that would justify a moderate dose of rate hikes -- that is another one or two -- and a pace of growth that would have the Bank of Canada waiting a lot longer than that,” Shenfeld said.